Welcome to the Pikes Peak Area, from Jim, Dee and David Ozburn, owners of Falcon Meadow RV Campground. The family started this campground in 1959 and have been happy campers ever since. 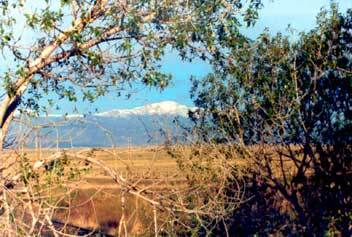 Our forty-five site campground is at 6,800 feet altitude, looking across the 20,000 acre Banning-Lewis Ranch with America's Peak, Pikes Peak (14,110 feet altitude) in the background. We are a small rural family campground on the high plains of Colorful Colorado that is open all year. Our roads are gravel and our meadow is buffalo grass and dandelions with some yuccas and a few trees. We are a quiet, simple campground with big sites (RV and tent) and more big sights (Pikes Peak and the Front Range) of Colorado. Falcon Meadow RV Campground is located on US HWY 24 about 15 miles east of downtown Colorado Springs and about a mile west of Falcon Town Center. We have convenient access to all of Eastern Colorado Springs, Black Forest, Falcon and points east. We are about 60 miles west of Limon, Colorado. We have big, full hook-up pull thrus for the big rigs (20-30-50amp) and tent sites large enough to spread out. We have a great convenience food store. Our WI-FI Wireless Internet is free! We sell gasoline, propane (bottles and for motorhomes), ice and wood. Our restrooms-showers and laundry are open 24-7. We have a handicap accessible restroom - shower unit. The rec-room has a cable TV for your viewing. Your TV antennae should pick up over a dozen channels. We have a play area and plenty of room to walk your well behaved dog. The central fire pit is for all to enjoy.